All girls in years 3-6 performed in a spring concert in the Longton Hall. 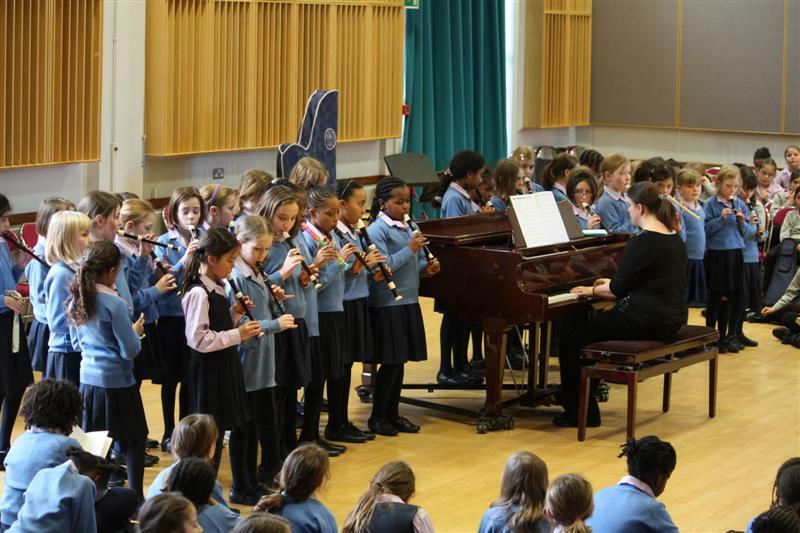 It was fantastic to see that every girl had something to contribute in one of the many ensembles that took part, as well as some fantastic soloists. The programme started with items from the 3 and 4 choir, who sang songs with a cross curriculum theme- Chop and Change told the story of the wives of Henry VIII, while Last Kiss Goodbye was based on letters from mothers to their children during the evacuation in WW2. The whole of year 4 showed us some of the skills they had learnt in recorder lessons, and played Hunstman’s Chorus completely off by heart. Year 5 classes performed a beautiful rendition of I Believe, accompanied by Grace and Alicia on the flute and Francesca on the recorder. Year 6 brought their favourite pop performances to the concert with songs by Adele. There were also performances from the string, wind, percussion and brass ensembles and it has been great to see all of these ensembles grow in size over the last term. Ukulele club is now a fun addition to music club on Wednesday break time too.